Pick of the week: “The Hunt“ — My full review is here. 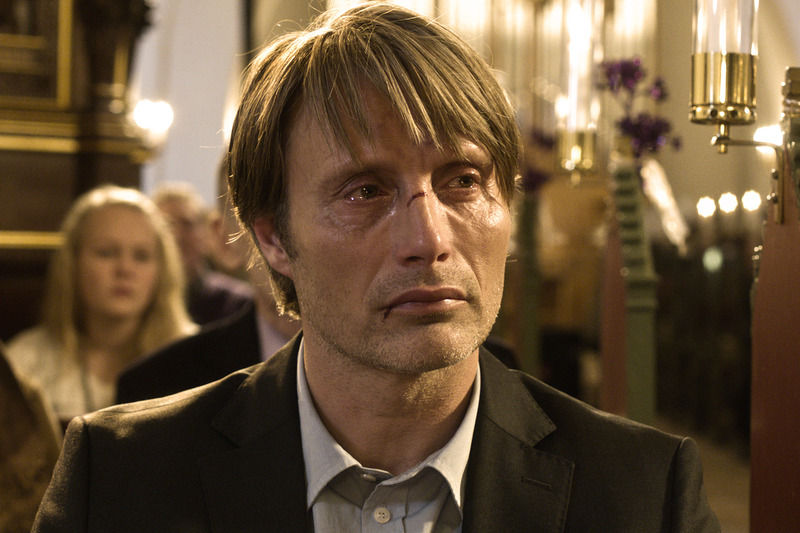 This Danish film is on the shortlist for Best Foreign Language Film for this year’s Oscars. It stars Mads Mikkelsen as a kindergarten teacher who becomes the town pariah after a young girl makes a false accusation against him. It’s reminiscent of “The Crucible” in showing how suspicion can spread through a small town, overwhelming judgment, and how it is to stamp out. Foreign film of the week: “The Attack“ — My full review is here. A Palestinian doctor in Tel Aviv learns his wife was killed in a terrorist attack — and then learn the police think his wife was the terrorist. His journey back home to Palestine for answers forces him to confront the cultural divide he thought he had overcome. A sad and powerful film. Thriller of the week: “Side Effects“ — If this really is Steven Soderbergh’s last film as a theatrical filmmaker, he picked a pretty good one, as a wealthy couple and a pair of psychiatrists become enmeshed in a twisty thriller surround a new miracle antidepressant. Trust me, you don’t want me to say anything more than that. Classic of the week: “The Grapes of Wrath“ — An impossibly young-looking Henry Fonda plays Tom Joad in a fine adaptation of John Steinbeck’s Dust Bowl novel. Whenever there’s a stirring climactic speech, he’ll be there. Comedy of the week: “Spaceballs“ — This Mel Brooks “Star Wars” spoof was a box office dud on its release, but time has been kind to its zany wit. The “Alien” bit always puts me on the floor. ← Hey, I’m going to the Sundance Film Festival!